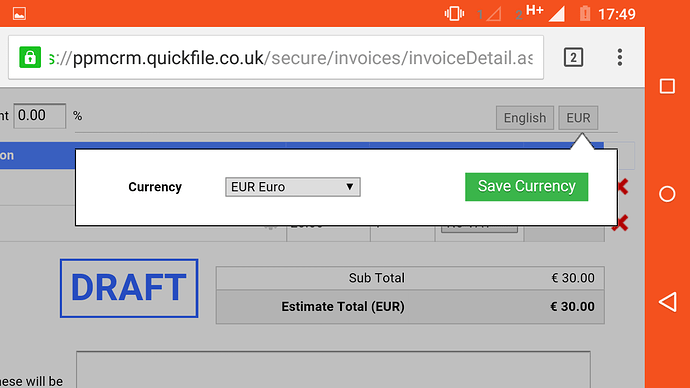 I need to make a quote (estimate) in Euros, although my default is set in sterling. After following the recommended steps I find my quote says Euros, but shows the sterling price for the individual items. What do I need to do for my client to receive the quote in Euros? If you set it to Euros (as below), it should update to show EUR rather than GBP. Make sure that you click ‘Save’ rather than just Preview as it doesn’t seem to save the currency change. I think you will first need to switch on Multi-currency before seeing the currency options. I tried this but it did save the currency change for me even when clicking preview. Many thanks for your replies but I don’t appear to have explained myself properly. I am switched to multi-currency and I select Euros on the quote, but when the quote appears before printing, the Euro sign (€) is clear but the amounts (numbers) shown are my sterling prices, not Euro prices. Maybe, as you suggest, I didn’t ‘save’ before selecting Preview - I wasn’t aware that it was neccessary - I’ll try it. Thanks! If you create the estimate/invoice, select the currency then select the client. The system updates the estimate/invoice with that client’s default currency, so you need to remember to switch back. If you select the client first then select the currency it shouldn’t be a problem. I see one EUR quotation on your account and I don’t see any issue. You are aware that when you enter the quote, you are actually entering the figures in EUR not GBP? So the quote edit totals should match was on the preview and PDF. I’m not sure if you’re assuming that you’re entering in GBP and the system is then displaying in EUR when you preview or print? Hi Glenn, I’n not sure how to describe this. I have entered my parts list in GBP in my inventory, the majority of my customers will be in the UK, hence sterling. I have a some customers however in Germany and Ireland for whom I need to make quotes/invoices in their currency, Euros, for them to make any sense of them. The quotation on my website looks fine, except for that I need to display my Euro prices, not my GBP prices. On the quote it says Euros but it is actually displaying my GBP prices, not Euros, with a box showing the current exchange rate. According to the quote I have on my system, item 1 - Hill M10Hi-Z is GBP 1575.00, I need it displayed in Euros, which should be 2201.37 Euros per unit (GBP x Exchange rate). What do I do to display the item in Euros, not GBP? Ah ok. The inventory doesn’t have any concept of currency types. It’s just a templating system and will import the same amount irrespective of what currency you are using on your estimate or invoice. In this case you would most likely need to manually convert the amounts to EURs. Oh dear, I thought as much. This makes the multi-currency feature virtually useless for me. I guess I would to enter each item in inventory seperately for each currency, updating the exchange rate each time I make a quote. As far as I can see, I wouldn’t be able to adapt the Quote template to allow manually adding converted prices. How on earth do other users make quotes in other currencies? Accounting is so multi-faceted, people use the software in all kinds of different ways, I’ve being doing this for 5 years now and every user tends to have very specific requirements, with very little overlap. Multi-currency alone is a complex aspect of accounting that many other major systems only partially support. All our development is based on user feedback and demand. There are over 20,000 posts on this forum and I don’t recall this being a recurrent theme. I will open this up as a feature request, we could certainly explore further if other users add their support to this idea. Adding extra fields would actually require quite a lot of work to the back-end system, especially if they were to reside at the item level and perform calculations on the itemised amounts. One quick way to get the GBP to EUR amounts (assuming you aren’t setting quantities) is to drop the exchange rate into the quantity column as follows. Thanks for the tip Glenn, unfortunately I will nearly always be dealing with multiple units - at least I hope I will!